Makalu trekking leading a challenging trek to the Base Camp of Mount Makalu the world's fifth highest mountain trekking including crossing of Shipton La pass. This trek takes up deep into the eastern Himalayas, providing some of Nepal's most unseen and amazing scenery. From Tumlingtar by walking north, up the Arun river, Sedwa and Num, crossing Shipton La (4127m) into upper Barun Khola valley for a close look at Makalu (8475 m) and chamlang (7290 m). The trek to Makalu base camp visits one of the most remote and unfrequented areas of Nepal. The Barun Valley is part of huge international protected area under an agreement between China and Nepal. 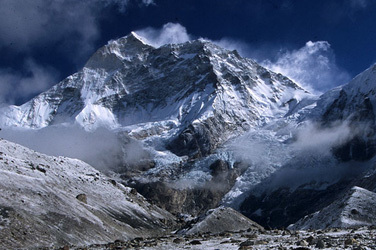 The Makalu Barun National Park was established in 1992 as Nepal’s eight National Parks. The park of 2330sq.km is bordered by the Arun River in the east and the Sagarmatha National Park in the west. Barun Valley is a sanctuary for wild animals such as wolves, lynx, fox and the elusive snow leopard. Our descent into the pine and rhododendron forest from the Barun Valley takes us past the lower Barun Glacier and into the Makalu basin and to Tumlingtar to catch the flight back to Kathmandu. Travelers who is interested normal route they just go to Makalu base camp and return same way but who interested to make more challenging trekking and have some climbing experienced in previous they choose Makalu base camp with sherpani Col cross east Col or west Col then reach in Everest region. Our company - Alpine Adventure Club Treks & Expedition has good experienced on both routes you can choose which is you feel comfortable for your holiday trip in Nepal.